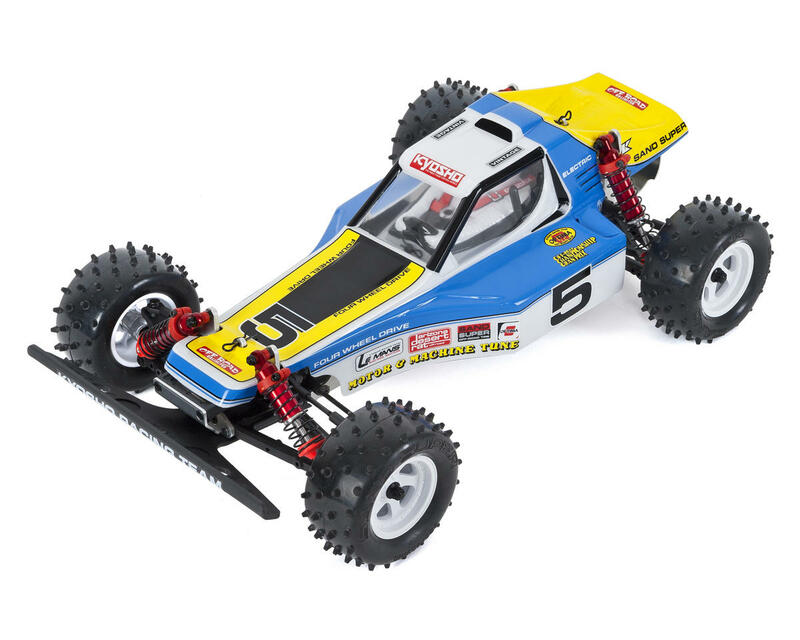 The Legend Returns - vintage RC at its finest! 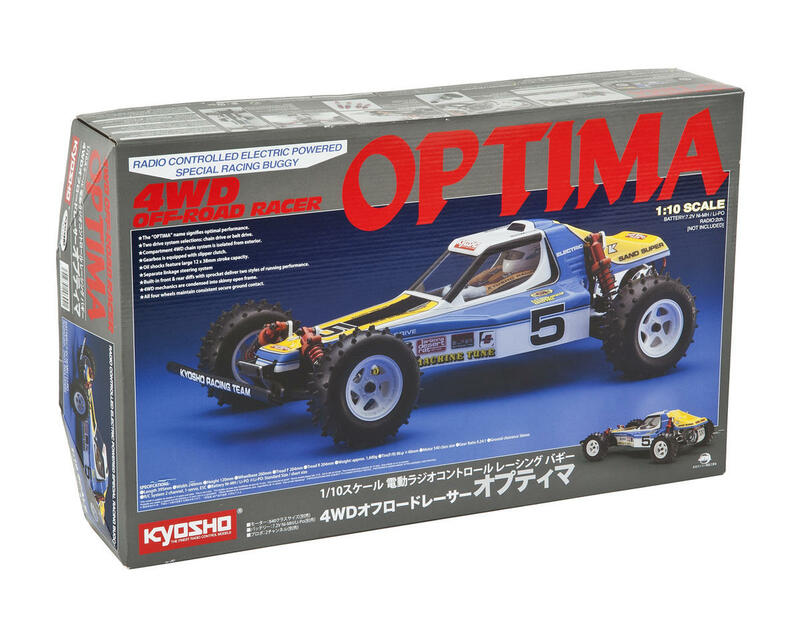 The Kyosho Optima 1/10 4wd Buggy was originally released in 1985, and was a technical masterpiece that set a new standard for RC performance. 30 years later, the original Optima has become the white buffalo of vintage enthusiasts and collectors around the world. With a blend of vintage style and modern technology, the Optima is once again ready to lead the charge in a battle for on track dominance. 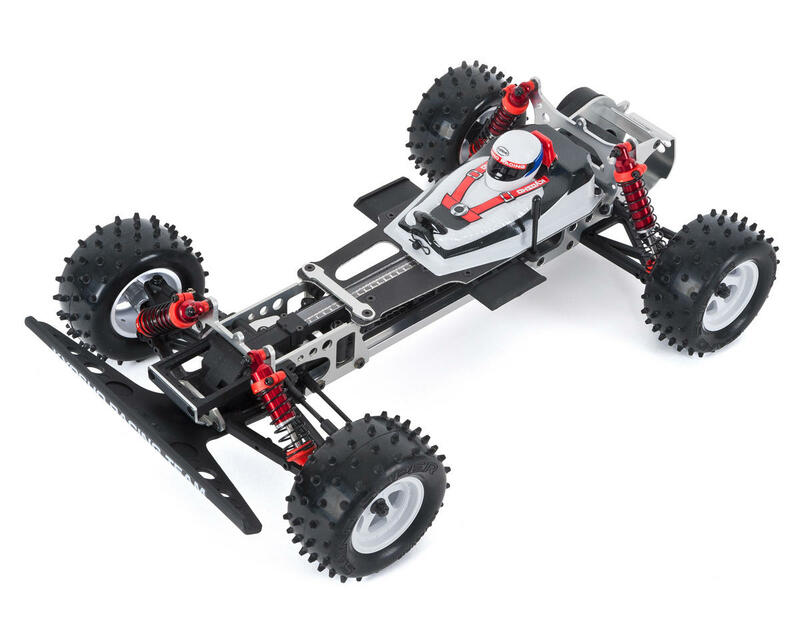 The Vintage Series Optima features the same narrow backbone shaped chassis that provides the platform for optimal geometry with large steering angles, long 35mm suspension stroke and double wishbone suspension. Recreated in the image of the original design, the the 4WD chain drive system is housed inside a sealed compartment and the gears and gearbox at the center of the drive train are equipped with a robust metal counter gear pinion and rear diff case. The drive train also features a slipper clutch and precision 48-pitch gear modules that reduce drive loss and fulfill the potential of modern power sources. Modern features have been added that include the choice of chain drive or belt drive as well as big bore shocks on front and rear that have been recreated in the original Optima colors. The rear hubs feature inserts that allow you to tune the amount of outboard toe in. The battery compartment allows the use of standart NiMH packs, as well as standard and shorty type LiPo. The distinctive Optima Spike Tire pattern has been recreated with softer, high grip rubber compound. Plus, the kit includes a complete set of hex screws and ball bearings. These features combined create a car that looks like the original, with performance that far exceeds anything the original car was capable of. 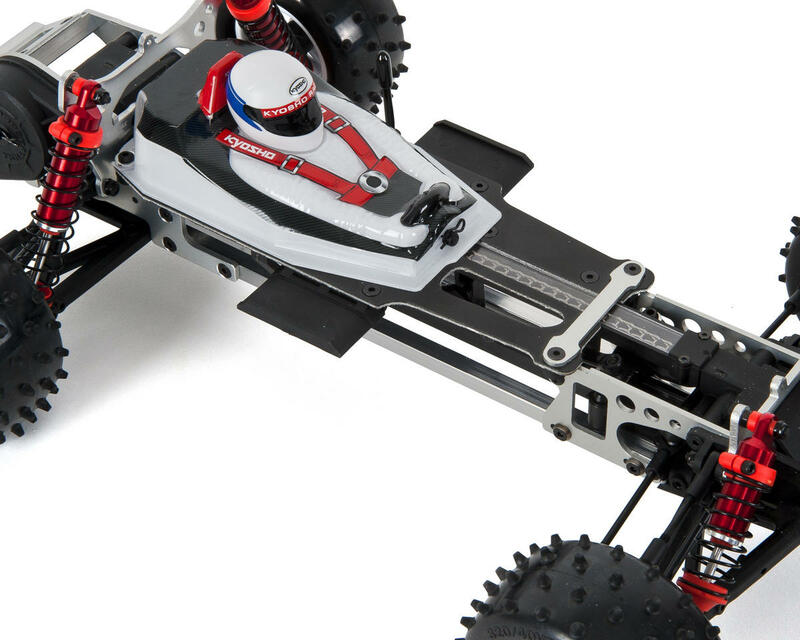 Chassis: All plates and the main chassis bars are now 6061T6 aluminum (counter sunk). 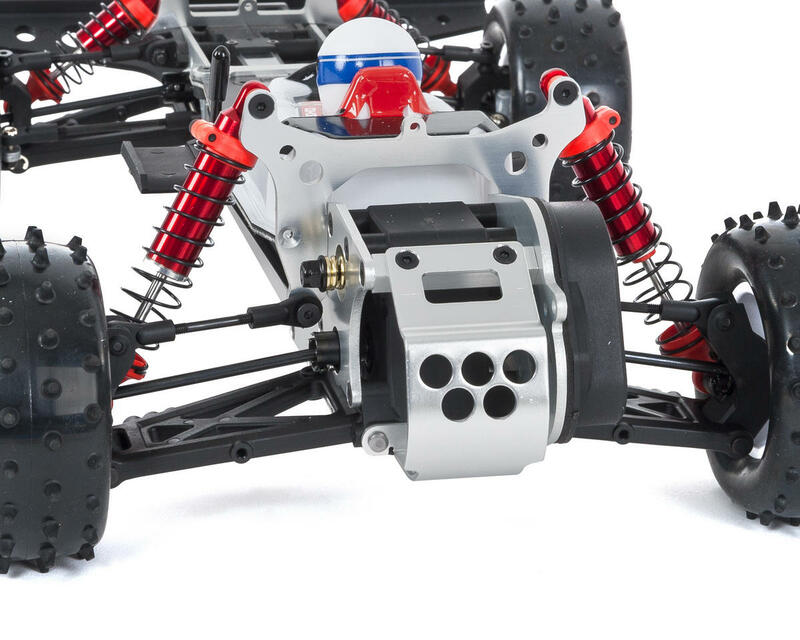 Aluminum chassis bars are slightly thicker for more durability. Drive-train: Kit includes both chain and belt drive trains allowing use of more powerful motors. Diff gears now have ball bearings installed. Gears: Now in 48 pitch gears. Sintered alloy gears combined with high impact nylon gears and newly added slipper clutch will cope with the current power plants. Shocks: 10mm diameter aluminum cylinder with SUS shaft allows improved damping. Tires/Wheels: Slightly modified tread designs and softer compound for superior grip and handling. Rear tires include inner sponge. 1 piece wheel design. Option Parts: We will release various option parts. 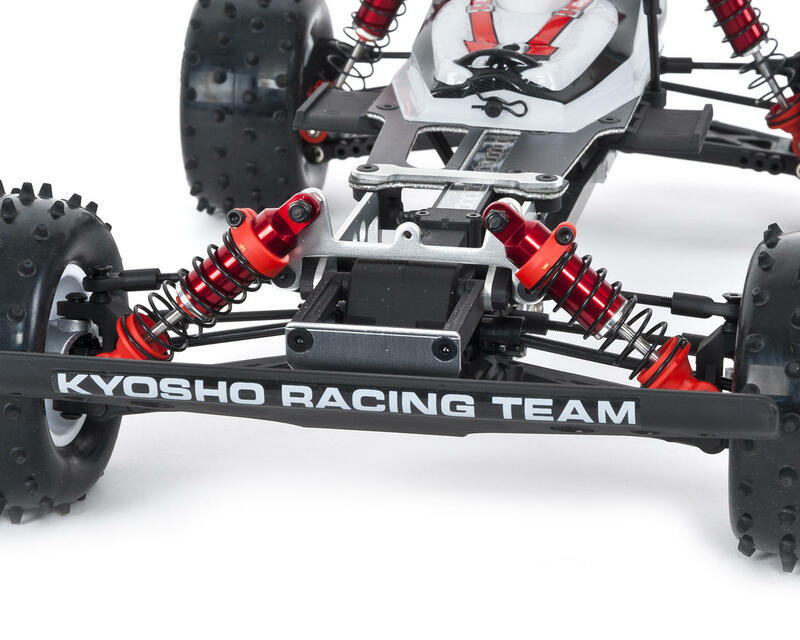 Electronics compatibility: The 2014 Scorpion is compatible with the current standard servos, receiver units, ESC's, motors and battery packs. Packaging: Similar to the original with blister pack showing some of the parts included. Some parts will be preassembled and parts will be bagged in steps following the instruction manual for easy assembly. Always wanted one when I was a kid. What fun to build. Comes with decals to make it look just like the picture and it looks awesome! Great build quality. My only complaint is the shock body seals are hard to install.